What's missing from Apple App Store's 5th birthday posters? It doesn't have quite the same ring to it as Bilbo Baggins' eleventy-first birthday party, but Apple's App Store turns five on Wednesday, and Cupertino is pulling out a few stops to celebrate. A number of journalists have received posters from Apple that commemorate the upcoming occasion. On them, Apple listed a number of its App Store's various milestones across a "timeline" that's really more a chart of total app and game downloads. For example, Apple calls out the store's one-billionth download on 4 April 2009, and notes that the popular game Doodle Jump premiered shortly afterwards. Apple's two-billionth download came a few months later on 28 September, but it would be a bit more time until the premiere of one of the platform's more wildly successful games, Angry Birds, on 12 February 2010. The chart continues with apps, milestones and, of course, Apple product releases until the Store's most recent milestone – 50 billion downloads as of 16 May 2013. 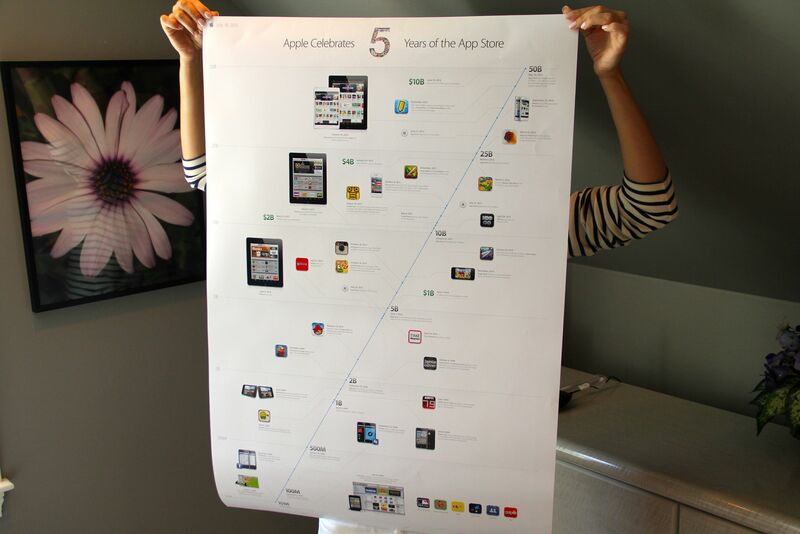 As noted by All Things D, there are quite a few "milestones" that Apple left off its poster – for obvious reasons. That included a 2010 report by The Wall Street Journal that showed how 56 of 101 tested smartphone apps were submitting users' personal information and phone identifying codes to advertising networks, many without users' permission. There's also all the in-app subscription squabble that Apple was having with content publishers, a thorny issue that was finally resolved in 2011 when Apple agreed to remove restrictions on content pricing and availability. Previously, Apple was planning to force apps that allowed users to access content sold outside of Apple's store to also make that content available via in-app purchases – which would then be subject to Apple's commission. "Our philosophy is simple — when Apple brings a new subscriber to the app, Apple earns a 30 percent share; when the publisher brings an existing or new subscriber to the app, the publisher keeps 100 percent and Apple earns nothing. All we require is that, if a publisher is making a subscription offer outside of the app, the same (or better) offer be made inside the app, so that customers can easily subscribe with one-click right in the app," then-CEO Steve Jobs said in a statement. Is Apple's poster missing anything else? Certainly. We'd love to see a little marker for when little pricetags started to become the "norm" for games and apps, and how the various pricing tiers progressed through Apple's five-year history. Or, for that matter, a track of the App Store's popularity against its desktop and laptop counterpart, the Mac App Store. And there's always room for the controversial apps. Perhaps a little frowny-face logo could accompany the App Store's removal of "Bang with Friends" in 2013 or the constant rejections in 2012 of an app, Drone+, that gave users notifications every time it detected that a US drone strike hit Pakistan, Yemen, or Somalia, based on news reports. While we highly doubt Apple would want to commemorate the event with a poster call-out, the App Store also saw its first malware app in July 2012. The app, "Find and Call," would upload the contents of a user's address book to a third-party server, and those within the book would find their email addresses and phone numbers spammed to heck with promotions for the Find and Call app itself. Apple promptly removed the app once its actual intent became known, but the entire ordeal was nevertheless noteworthy for being the first time that malware had slipped past Apple's review process.